Acupuncture aims to treat the root of a condition, not just the symptoms by restoring proper functioning of the body at the deepest levels. As well as healing and helping manage specific health problems it can help with stress and promote general well being and calm. Acupuncture is an important element of traditional Chinese medicine dealing with the flow of qi. It probably began to be used more than 2500 years ago, and its theory was already well developed at a very early time, as is shown in the Chinese classics Huang Di Nei Jing (Yellow emperors inner classic ~200 BC) and Nan Jing (Classic of Difficulties~100-200 CE). 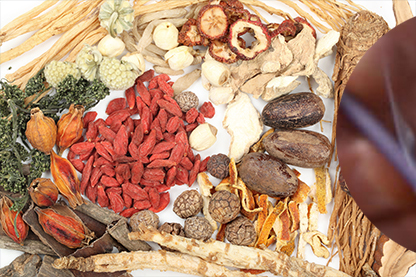 Chinese herbal medicine combines a selection of herbs into a formula specific to the problems of the person which restore the body to balance and health. This is in keeping with modern ideas about metabolic and genetic typing to target drug therapy. It has enormous healing potential and is the subject of much research for new medicines as well as being possibly the longest established healing tradition in the world. Tui na massage is traditional Chinese massage, the name means ‘pushing, grasping’ and describes 2 of the techniques. Tui na works the body using the same channel and acupoint theory as acupuncture does. It has similarities to the better known Shiatsu, but also has some unique methods. Chinese Medicine is a long standing system, or systems of traditional medical practice and was the most advanced in the world until the late 19th century. Moxibustion is a therapy so closely related to acupuncture, that the Chinese character for Acupuncture zhen-jiu, jiu contains the fire radical, as a whole understood as meaning that acupuncture involves moxibustion. Facial Revitalisation Acupuncture is a great alternative for individuals who want a holistic approach to looking younger while improving their overall health.